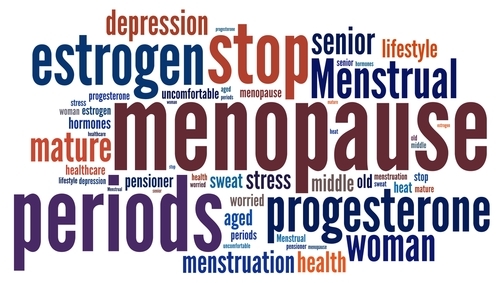 What is Menopause and Perimenopause? Menopause, *groan*, what is it? When does it occur? How do I know it is happening to me? What can I expect? What can I do about it? Menopause is defined as the absence of menstrual periods for 12 months. The menopausal transition starts with varying menstrual cycle length and ends with the final menstrual period. Perimenopause is a term that means “the time around menopause.” It is often used to refer to the menopausal transitional period. Menopause is the time in a woman’s life when the function of the ovaries ceases. Ovaries are the main source of female hormones. Perimenopause is different for each woman in intensity and duration. Scientists are still trying to identify all the factors that initiate and influence this transition period so you’re in good company if you don’t understand it fully either. The average age of menopause is 51 years old. Most women reach menopause between the ages of 45 and 55, but menopause may occur as earlier as the 30s or may not occur until a woman reaches her 60s. As a rough “rule of thumb,” women tend to undergo menopause at an age similar to that of their mothers. Women in perimenopause, can experience irregularities in the menstrual cycle along with the typical symptoms of early menopause. These symptoms can begin up to 10 years prior to the last menstrual period. Suffice it to say that this transition does not happen overnight.